Gaza and the ailing Iran nuclear deal have been topping a meeting of EU foreign ministers in Brussels. 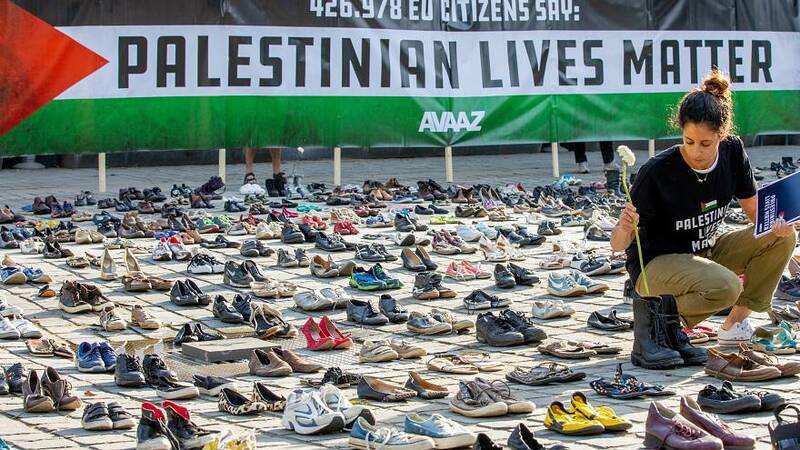 Outside the EU Council building, campaigners placed 4,500 pairs of empty shoes as a reminder of the loss of lives in the Israeli-Palestinian conflict over the last decade. Ministers agreed immediate action was needed to prevent further deaths in Gaza and that humanitarian access needed to be guaranteed. "The tensions in Gaza happen in a context of lack of a peace process and in the context of developments in Jerusalem and we still are all committed, all the 28, to consider Jerusalem the future capital of the two states," EU foreign policy chief Federica Mogherini told reporters. Mogherini also re-stated the EU's support for the Iran nuclear pact, ailing in the wake of America's pull out. She stressed: "For us, it's not about an economic interest, this is about a security interest for the European Union, because in the absence of the nuclear deal with Iran, we believe the security of the region and of Europe would be at stake and so this is why we are insisting so much about keeping this agreement in place."